FX markets are famous for attaching or conjoining values and metrics to individual currencies, their pairs and crosses. They believe that these “factors” have an influence on and are reflected in the price of those currencies. For example, the Japanese Yen is seen as the barometer for risk-off flows, while the South African Rand is often thought of as the "canary in the coal mine," as far as emerging market stress is concerned. Certain currencies are inextricably linked with the fortunes of a particular commodity. The most obvious example is the US dollar and Crude Oil. Though of course, one could make a case for the Dollar and most commodities, simply because it is the medium in which they are predominantly priced. The primary connection between money and commodities was that between Gold and national currencies. Gold was seen as a guarantee of the value and spending power of a national currency, through the Gold Standard. A system that ensured that claims on the Central Bank or National Treasury were backed by equivalent holdings in Gold. This was a particularly important relationship when paper currency replaced Gold coins. It prevented governments and bankers from printing money with impunity if they wanted to retain their good name amongst lenders and investors. Though over time the relationship between these liabilities and Gold would be eroded and replaced by a credit rating, or an assessment of the nation's ability to service and repay its debts. Before the Gold Standard, Gold had been used as a vehicle for determining rates of exchange between nation states. This is simply because once you had determined the cost of a known quantity and quality of Gold, in two or more local currencies, you had a metric to measure the value of the underlying currencies, relative to each other. That relationship still has a certain amount of validity today, although it has also been modified. For instance, the Economist magazine famously compares the cost of a "Big Mac" in cities around the world, to create a comparative cost of living index. The medium may be different, but the method is the same. Leaving Gold to one side for the moment, other currencies (countries) are often linked to a specific commodity because they are a large producer or consumer of that commodity. 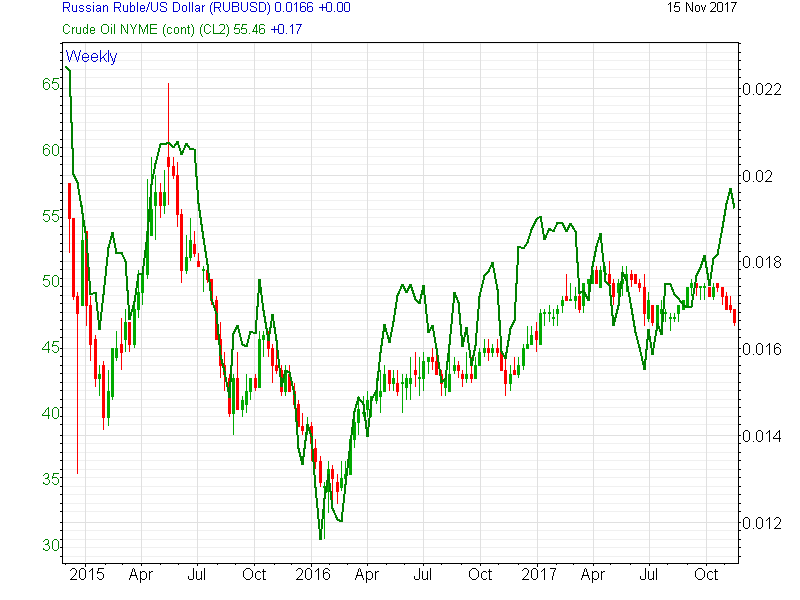 A very good example of that relationship would be the Australian Dollar with Iron ore. Iron ore is one of Australia's largest exports alongside coking coal. Much of which is used to smelt that very same Iron ore. In recent times, a ready market for both Iron ore and Coal has developed in Australia's backyard as China experienced explosive economic growth. Conversely, the chart below confirms China's dominance as a consumer and importer of Iron Ore. The country imports 71% of global Iron ore exports, dwarfing its competitors and fellow steel manufacturers; Japan and South Korea. Charts sourced from the Observatory of Economic Complexity. Traders should continue to watch the relationship between Australia and China, which will develop and change over time. As the Chinese economy matures and moves away from heavy industry and manufacturing and towards a more service-based economy. As that happens China's demand for Australia's natural resources may well decline. But there will be new opportunities in areas such as Banking and Financial Services. The interplay between these forces will have a direct effect on the region's exchange rates which in other words means opportunities for traders as the markets try to price in these changes. Some of the relationships assigned to commodity currencies are historic. However, they’re not necessarily that relevant or grounded in the modern economies of those countries and currencies. For example, the Canadian Dollar is often associated with Crude Oil, mainly due to large deposits of heavy crude within so-called tar sands, found in the Athabasca province of Alberta. And yet Crude Oil accounted for only 10% of Canada's US$388 billion worth of exports in 2016. Cars and Automotive parts accounted for almost 16% of the total. (Data sourced from the Observatory of Economic Complexity). But in the mind of the market, Canada remains linked to the fortunes of Crude oil prices. That may be because the scale of the tar sands deposits is such, that if they could be entirely recovered Canada would be a top three crude producer. 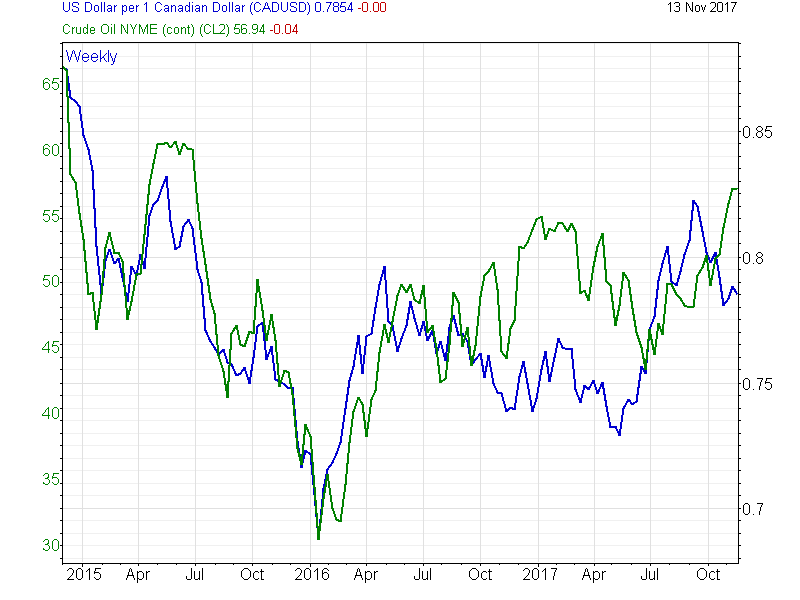 The relationship between the Canadian Dollar, also known as the Loonie, and Oil can be seen in the chart below. Mexico and its currency, the Peso, has long been associated with Silver, and in 2016 the country was responsible for some 11% of all Global exports of the precious metal, which were worth approximately US$16.7 billion. But when we break down Mexico's total exports, we find that Silver accounts for just over 0.5% of the exports from the country. As with Canada, automotive parts and finished vehicles at 21% are much more significant exports. While Crude Oil and Computers, at 5.7% and 4.1% are also important components of Mexico's economy. The common theme between Mexican and Canadian economies is a shared border with the USA and membership of NAFTA (North American Free Trade Area). It is the international trade that created the historical relationships between Currencies and Commodities these type of agreements will take on increasing importance in future. The terms of NAFTA are currently being renegotiated, and there is a genuine possibility that the US could walk away from the agreement. That would have a dramatic and most likely negative effect on both the value of USD MXN and USD CAD. The charts below (source: HSBC research 2017) show just how important and complex these relationships are and just what's at stake. The currencies of all major producers are directly linked to Oil and its relationship to the Dollar. Middle Eastern names may not be that easily traded, and the Russian Rouble has had its issues with western sanctions.Though as we can see from the chart below, over the last three years, the Russian currency and the Oil price have been very closely correlated. Though I note that some divergence has recently appeared between them. As we noted earlier, the US Dollar is associated with all commodities simply because it's the currency in which they are priced. As a result of this, fluctuations in the US currency's value has a direct effect on the price of those same commodities. A stronger US Dollar has historically been negative for commodity prices. That's because foreign currency buyers of those Dollar-denominated commodities have to pay more for those commodities. Conversely, a weaker Dollar is positive for commodity prices and commodity-related investments, such as the currencies under discussion in this article. Of course, US consumers are largely insulated from these Dollar related fluctuations over time, as they always pay for their commodities in US Dollars. In future, however, that may change. The US Dollar occupies the role of global reserve currency. It has effectively done so since the end of World War one when it replaced the Pound Sterling, which replaced the Spanish Gold Doubloon. The US Dollar faces competition in this role from both the Euro and the Chinese Yuan. Though it is the Chinese currency backed by the sheer scale and numbers of the domestic Chinese economy that probably poses the most realistic threat to the Dollars supremacy. A change at the top of the pecking order of global currencies is still some way off. However, as the Yuan has yet to attain full convertibility, which is essential for any pretender to the Dollar’s crown. But the Yuan’s inclusion on the list of IMF reserve currencies and membership of the basket of currencies that make up SDRs or Special Drawing Rights, (which are specialist interbank foreign exchange reserve tools) has certainly set the wheels of change in motion. In 2016 China imported US$1.32 trillions worth of goods, much of which was in the form of raw material or commodities. This gave the Yuan a genuine claim to be a currency in which commodities ought to be priced. For example, China Imports approximately US$45.26 billion worth of Copper ore, a figure that coincidentally almost exactly matches the production of ore from Chile; the world's top producer. Copper is itself sensitive to changes in global growth, being used in construction, electronics and many other industrial applications. Could it be that in the not too distant future the Yuan vs the Chilean Peso would play on these kinds of global macro factors? China is also the world's top Oil importer, and the country has announced plans to launch a Yuan priced contract in Shanghai. Though there may some domestic demand, it's clear that major will easily sway away from the traditional dollar-priced models. That said, if you are an Oil exporter, looking to diversify away from the Dollar and into other reserve currencies, then getting paid in Yuan and being able to hedge in the same currency may have an appeal for you. China has also attempted to boost the appeal of Yuan by arranging a number bilateral swap agreements with other central banks, which means they can directly access Yuan liquidity from The People's Bank of China. Something that could prove very useful in periods of financial stress. In a relatively short article such as this, it's not possible to cover all the relationships that exist between Currencies and Commodities, but we trust this has given you a flavour of what they may be. You can track the relationship or correlation between Commodities and Currencies by using our Smart Trader Tools, in particular, the Correlation Matrix and Correlation Trader.